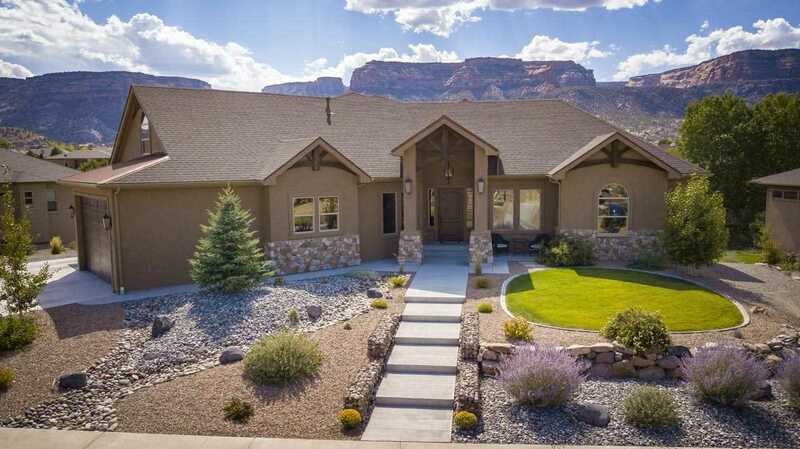 This is a magnificent custom built home with stunning views of the Colorado National Monument! Over 4500 sq ft, 5 bedrooms, 4 baths, bonus room, and office with tons of upgrades and gorgeous finishes everywhere you look. The gourmet kitchen is absolutely wonderful with granite, professional grade appliances, gas cooktop, double ovens, beautiful island & much more! The Master is huge w/ walk in closet, and 5 pc master bath! This Redlands home is ready for you to move right in and you will feel the pride of ownership. Downstairs has a full bath and 2 bedrooms, plus a large family room & access to the inviting back yard. The ample garage space will fit all your vehicle and toys. There is even an additional garage bay / workshop on the lower level of the home. This sought-after neighborhood also has trails all around for your recreation!